My father, Valentin Z. Rodriguez, passed away on February 11, 2014 at approximately 9:45 AM. The immediate cause of his death was respiratory failure, candidemia, sepsis syndrome and renal failure. All with which started from a mild fever and cold that led to the flu and developed into pneumonia. But none of this is relevant in my mind right now. What IS relevant is that he was a great man, a caring man, a good husband, a loving father, a supporter, a true friend to many–he was so many things. I reflect on all the memories I have with him. He is the reason I am who I am today. He was one of the only people who could light a fire underneath me. A fire of desire to succeed and make something of myself and my life. I lost my mother recently as well, in September 2012. And during this difficult time of my life, I have found only one thing is for sure–only time helps heal the heart from losing someone special. I am surrounded by the love of my brothers. They help provide me strength to keep striving for the best. I now take care of my baby brother, Zack. He is nearly fourteen and this will be a huge change for me. But my parents would be proud. He will be well taken care of and I expect advice will be given from above from time to time. Again, none of this is design related, but this blog represents my mind in general, and this has overcome my every thought. However, to wrap my creative juices around it, I’ve created this graphic of the poem that was represented on my father’s funeral take-aways. 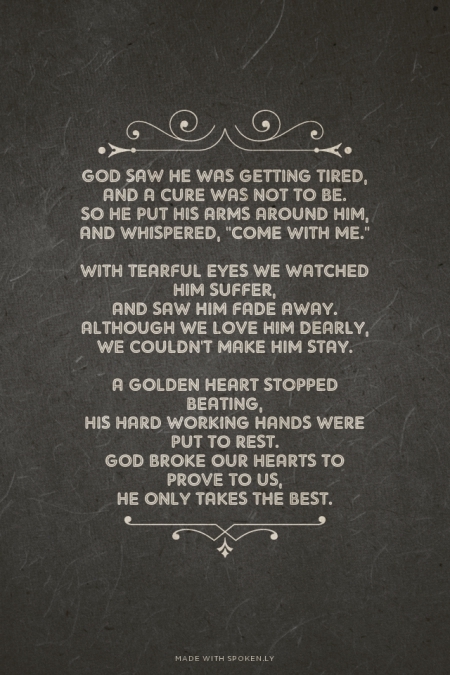 This poem describes my father and his journey to life in Heaven so distinctly. Deciding on Christmas gifts is always such a hassle for me around this time of year. I never know EXACTLY what to buy someone. I thought it would be nice to post a gift guide for those of you who might have a graphic designer on your list this Christmas. Whether it is a family member, friend or co-worker, this gift guide will definitely help you find the perfect gift! Perfect for someone who is trying out their hand in typography, type aficionados and for those who just love a design made well with amazing typographic work. The book is filled with amazing and not to mention really inspiring works. Written by famous American Graphic Designer Chip Kidd. Go is not your typical book about graphic design. The book also showcases how to creatively use the many graphical elements. Apart from that, the book invites it’s readers to complete projects that they can share at the site GoTheBook.com. We are sure that by just a mere mention of Paul Rand’s name to any graphic designer will make them squeal like little kids at the sight of chocolate. But what about giving them a book written by Paul Rand himself ? A perfect gift for those who have graphic designer family or friend who are raving about grids. This is also perfect for students who are going to take graphic design next school year. Here’s something great to give if you have a friend whose dream is to start their own design firm. This one great thing about this book is that it offers loads of advice to help designers on how dealing with clients and building a great relationship with them. Here’s something to manage those annoying cords better. Perfect for those who have a ton of stuff plugged but the problem is those tangled wires. If you have a friend whose looking for a nice desk drawer then this one is perfect for them! Can be stacked with the same product, durable and not to mention it locks! We suggest you get two of this awesome space saving drawer. A clean desk is a productive desk! Help your friends organize their things. Chuck those paper, notes, magazines even folders in this nice desktop drawer. Apart from the fact that this is an awesome space saver, the Cyanics iStick Multifunction Desk Organizer has a USB port, a compartment to place your phone and it has a nice design. What more can your designer friends ask for right? Similar to the Cyanics iStick Multifunction Desk Organizer the only difference is that it doesn’t have the multicompartments that the other one has. Instead it has a clear glass that acts like a mini table. Perfect for those who want to sketch out their ideas while working in front of the computer. It’s a pencil case and a sketch pad rolled into one. Apart from that the set is only 10-3/4 by 6 inches big which makes this one pretty compact. If that won’t put a smile to your friend we don’t know what is. Designers bring a lot of stuff with them and one of the most frustrating part in packing is where to put that humongous laptop of theirs. To make things worst some laptop bags doesn’t last that long. This travel backpack here by Kattee is perfect since it offers a nice big room for a laptop that can even fit a 17 inch laptop not to mention it is very stylish and durable. It’s frustrating and annoying for everyone with a smartphone or a table to find their gadgets out of juice before getting to their destination. Same thing for graphic designers even double at times since they need their smartphones or tablets to check emails, send out proofs and do minor tweaks. This is where Anker Portable Charger comes in it gives those gadgets extra boost of power specially during long travels. Speaking of bags Royal Essentials Art Cargo Carry Bag just looks amazing! Made by artists for artist is great for holding all your friend’s tools. It even has a detachable case to hold brushes. This device is pretty neat! It’s a multifunctional, portable and user-friendly device that allows you to transfer photos, music, movies and other files from an SD card and USB storage device to any smartphone and tablet. Not only that but it also doubles as a power bank. We suggest get 2 of this one for a gift and one for you. That completes the gift guide! Buying any of these gifts would certainly make any graphic designer’s holiday special!